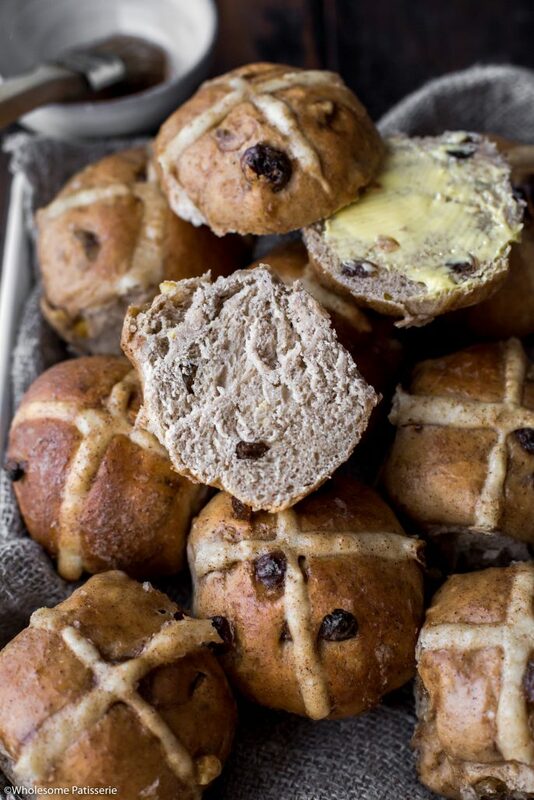 It’s Hot Cross Bun season and I hope you’re as excited as I am?! 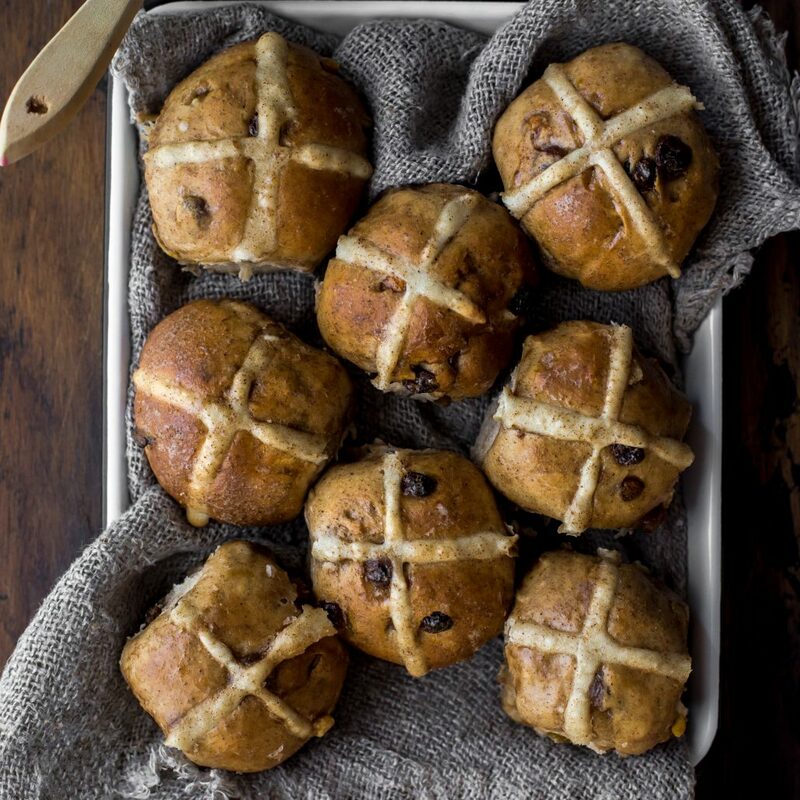 Hot Cross Buns and Easter Eggs are the epitome of Easter and I have the most delightful Traditional Hot Cross Bun Recipe to share with you. 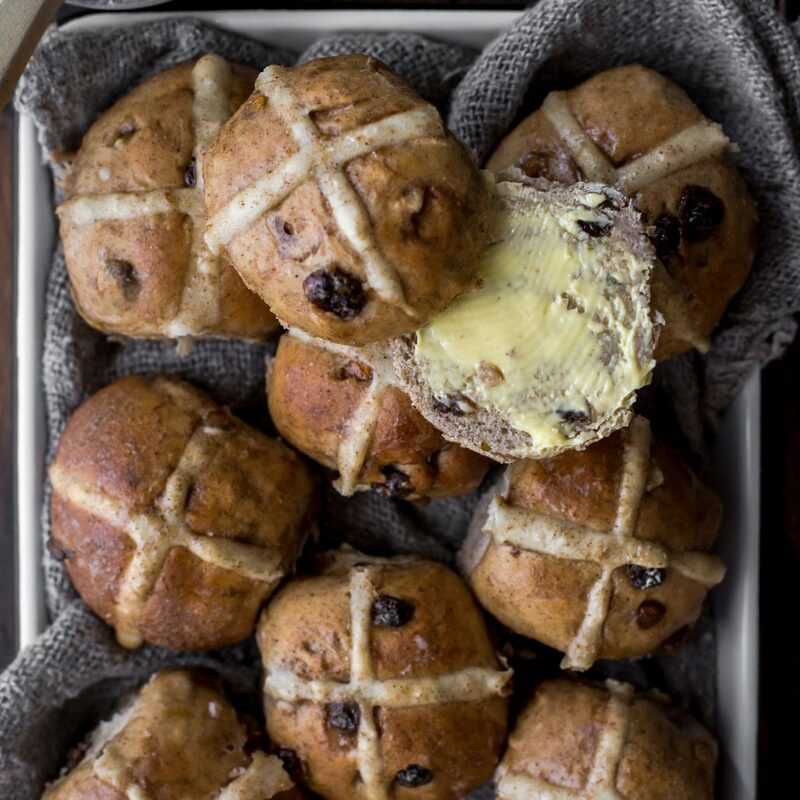 These hot cross buns are everything you can imagine them to be, warm, fluffy, rich and everything that words can simply not articulate. 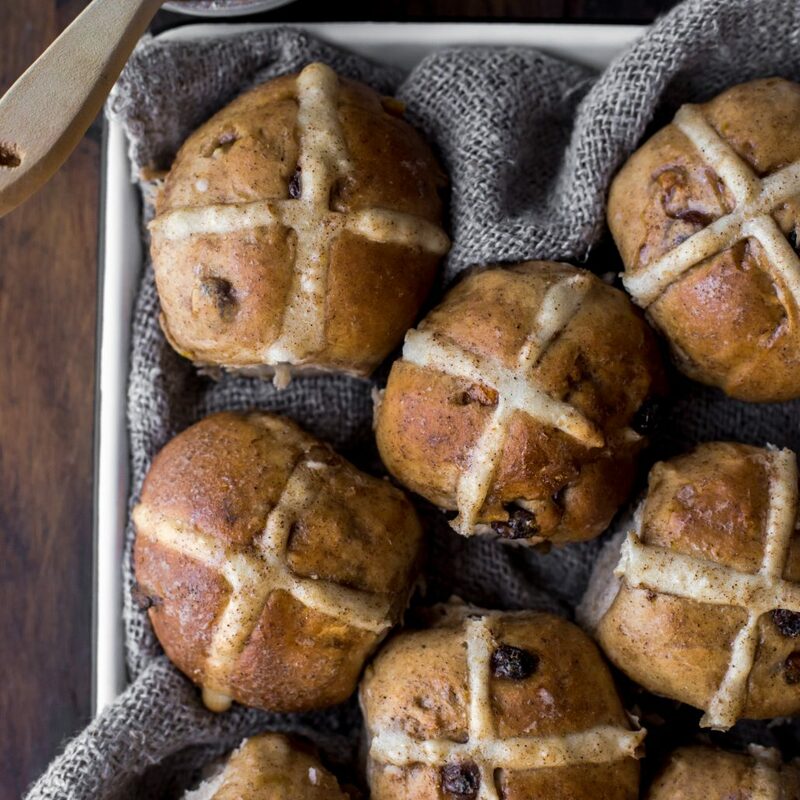 We all know that classic hot cross bun smell and this recipe provides just that. Get excited! Classic spices are infused, cinnamon, mixed spice, all spice, nutmeg, clove and a hint of grated orange zest. Speaking of orange, the liquid component of the glaze is freshly squeezed orange juice, how genius is that?! 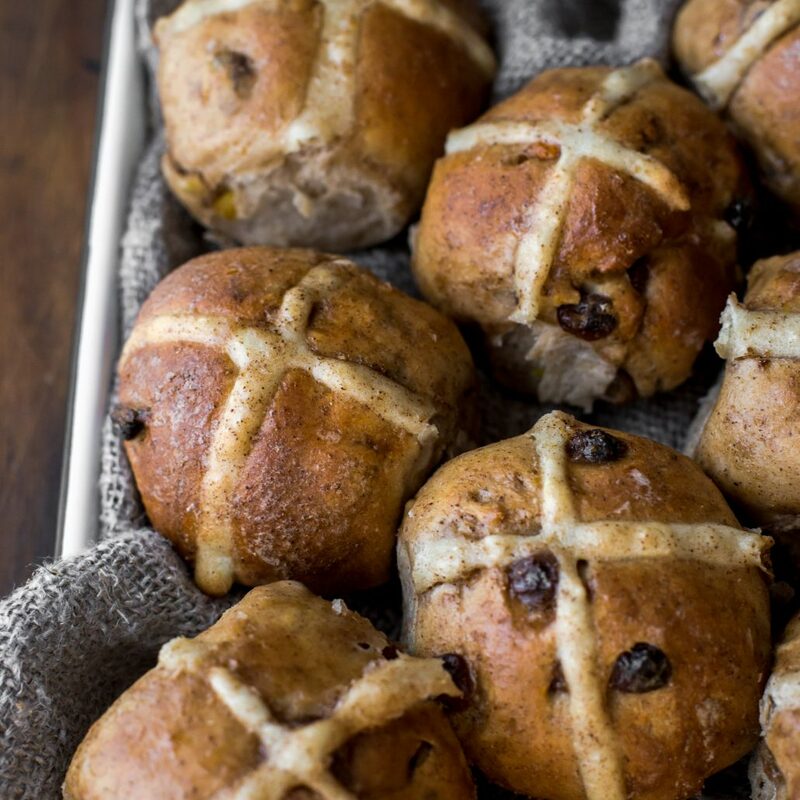 Homemade hot cross buns don’t come close in comparison to the store-bought variety and that’s more of a reason for you to bake your very own batch this Easter season. I know you will love this recipe, enjoy! In a large mixing bowl, add flour, yeast, sugar, mixed spice, cinnamon, nutmeg, clove and salt. Mix with a wooden spoon until well combined. Set aside. In a small pot, add milk and butter, place over a low-medium heat until warmed through, stirring to combine. Test it by dipping in your finger, you should not get burnt/scalded. Remove from heat. Make a well in the centre of your dry mixture. Pour in warmed milk mixture followed by the whisked egg. Using a wooden spoon, gently stir flour into liquid, mixing until it begins to form a dough. Before forming into a ball of dough, add sultanas, mixed peel (if using) and orange zest. Using your hands, mix the fruit into the dough. Turn dough out onto a lightly floured surface. Knead dough for 8 minutes until smooth and springy. Take a large mixing bowl and lightly grease it with olive oil or butter. 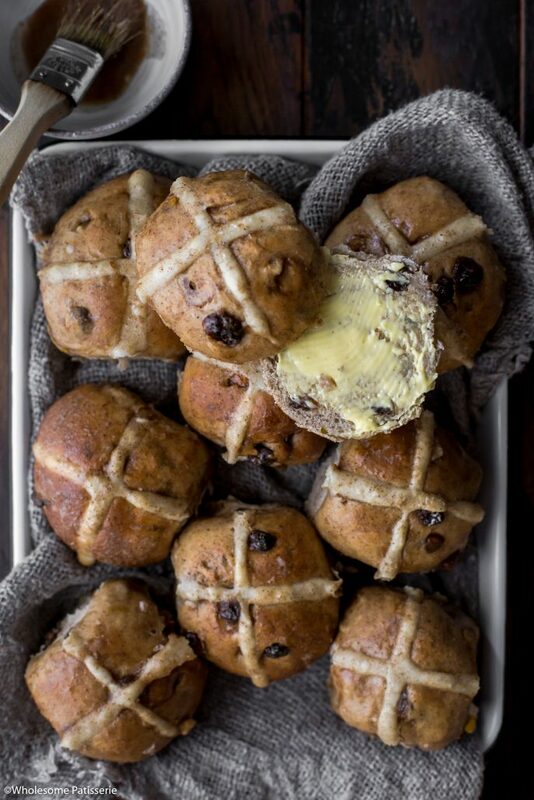 Place dough into greased bowl, cover bowl with a tea towel and place in a warm, draught free area for 1 hour or 1 hour and 15 minutes until dough has doubled in size. Punch down dough with your fist to deflate. Turn out onto a lightly floured surface and lightly knead for 30 seconds or until smooth. Line a large baking tray with parchment paper, set aside. Divide dough into 12 equal pieces TIP: weigh the entire piece of dough and divide that total weight by 12, leaving you with the weight needed for each individual dough ball. Roll each piece into a smooth ball. Place on lined tray in 4 rows of 3, slightly touching each other. 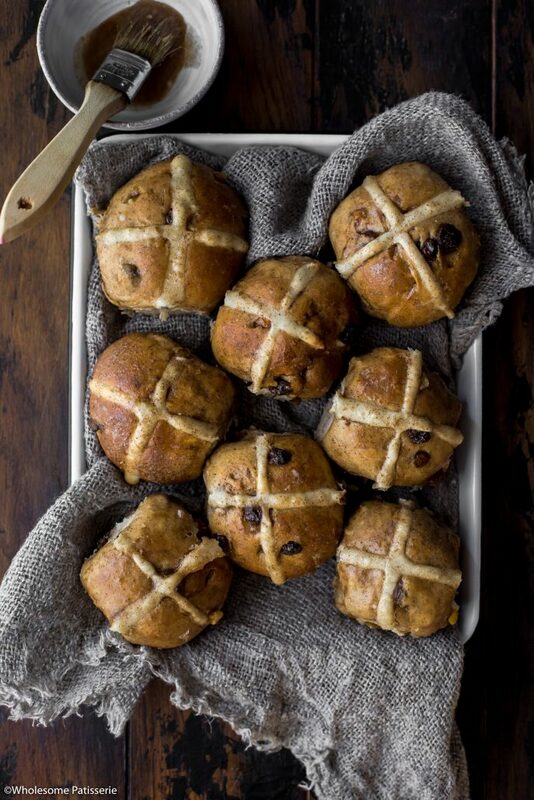 Cover with a tea towel and place in a warm, draught free area for 30 minutes until risen slightly. 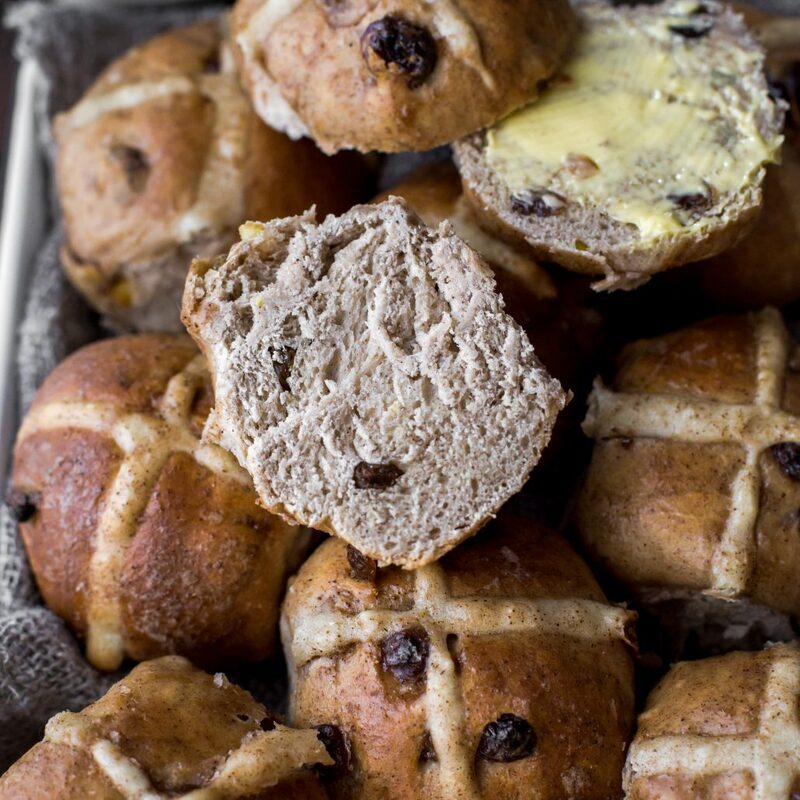 Whilst buns are rising, pre-heat oven to 190ºC fan-forced (375ºF fan-forced). In a mixing bowl, add flour and 6 tablespoons water. Mix to combine, adding extra water if needed to turn mixture into a thick paste. Prepare a piping bag fitted with a small round piping tip. Pour flour paste into bag. Bake for 15-20 minutes until lightly golden all over and they spring back when touched. 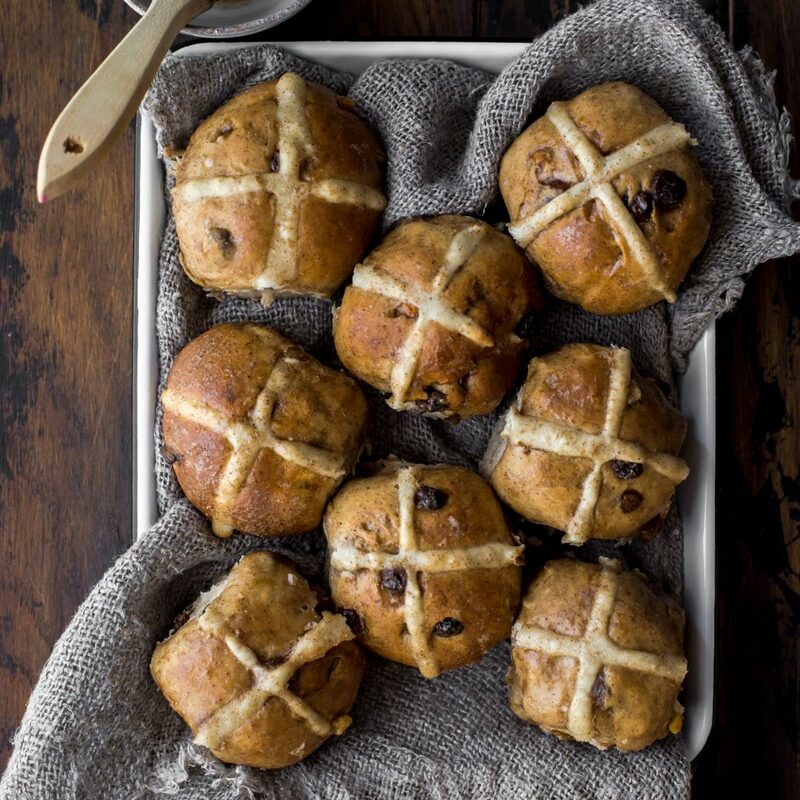 Make glaze whilst buns are baking. 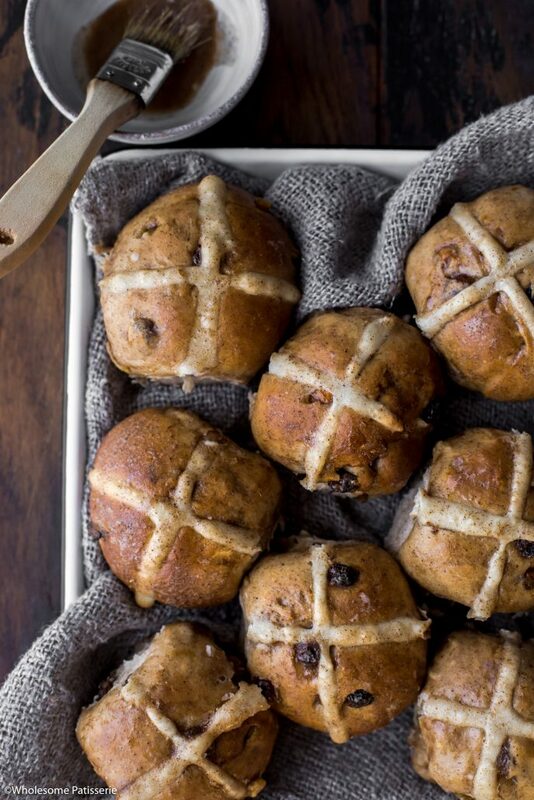 In a mixing bowl, combine icing sugar, cinnamon, all spice and 2 tablespoons orange juice. Mix to combine to a thick liquid glaze, adding extra tablespoon orange juice if needed to thin it out. 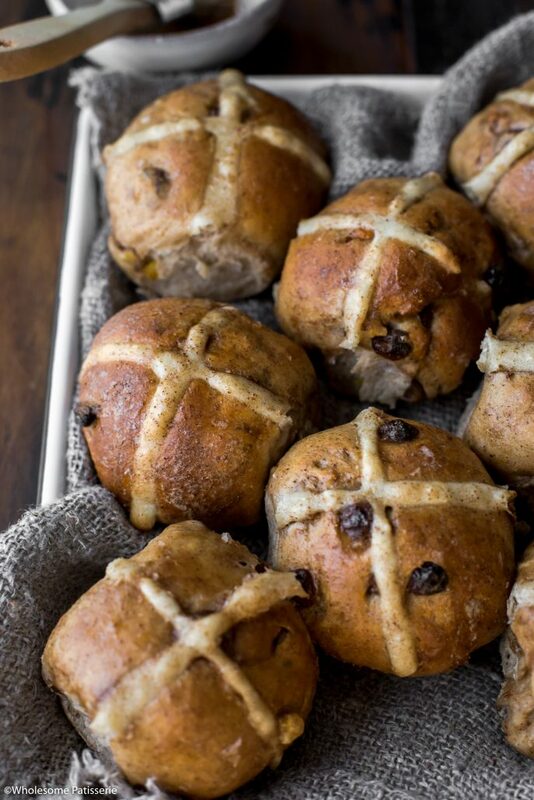 Remove buns from oven and using a pastry brush, generously brush glaze over each warm bun. Cool on pan for 10 minutes and allow glaze to set. Serve warm with a spread of butter or allow to cool completely and serve later. Store in an airtight container, in the pantry or refrigerated, for 2-3 days. 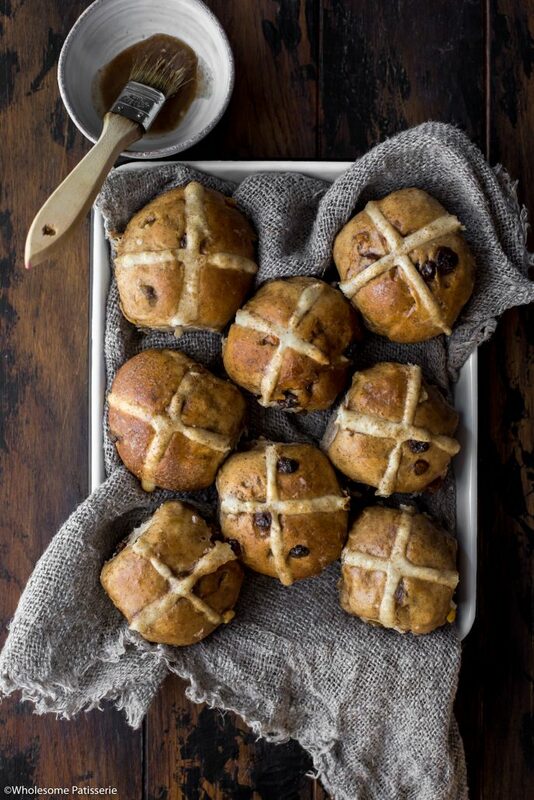 Best served freshly baked!